Get Access to Hundreds of the Latest Sweepstakes, Contests, Giveaways and More. Updated Daily, 24/7. Sign up for a Free Membership which includes tools to make entering to win cash and prizes easier and faster. 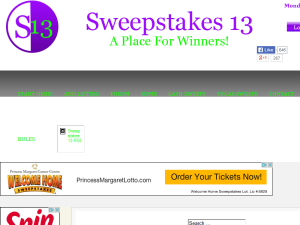 This what your Sweepstakes 13 - A Place for Winners Blog Ad will look like to visitors! Of course you will want to use keywords and ad targeting to get the most out of your ad campaign! So purchase an ad space today before there all gone! If you are the owner of Sweepstakes 13 - A Place for Winners, or someone who enjoys this blog why not upgrade it to a Featured Listing or Permanent Listing?